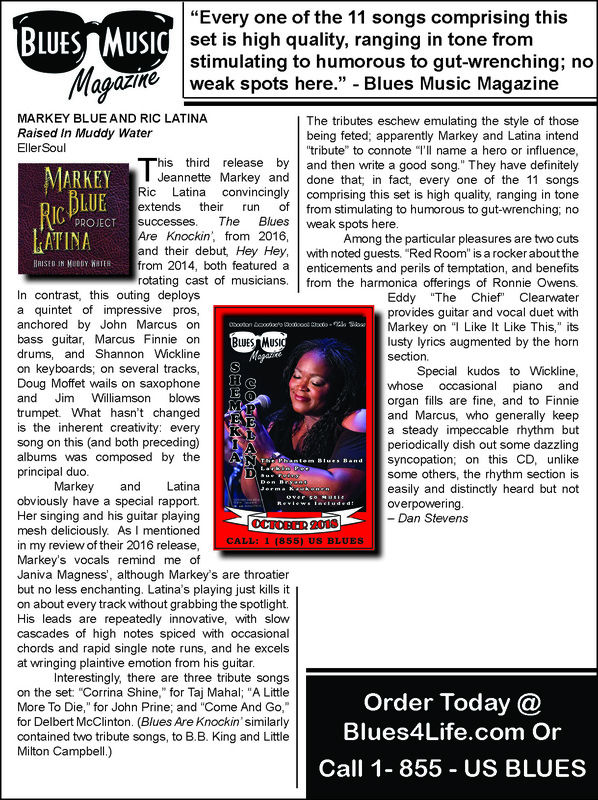 In the short amount of time since they first joined forces, Markey Blue and Ric Latina and their touring band have compiled a long list of accomplishments. The band has been headlining and playing festivals and clubs around the country and the world in support of their latest album. The band name has changed and with it comes some of the best music the writing duo of Markey and Latina has ever written. This album takes a walk through several sides of the blues genre, the swampy side of roots, rock and soul blues, traditional blues and two tribute songs. Raised in Muddy Water offers a little something for every blues palate. The team of musicians brought together for this release have a resume that reads like a 'who's who' of the music industry. 'Raised in Muddy Water' features, among others, Taj Mo drummer Marcus Finnie and longtime Tim McGraw bassist John Marcus. Blues Hall of Fame artist Eddy 'the Chief' Clearwater joins Markey for a vocal duet and trades guitar licks with Latina on 'I Like It Like This,' and Ronnie Owens provides harmonica on 'Red Room. ' The final song is a live 'bonus track' with guest musicians from Robben Ford's rhythm section (Brian Allen on bass and Wes Little on drums) and Charlie Daniels' keyboardist Shannon Wickline.